A non-refundable deposit of £200 per week is required upon making a booking, the full balance to be cleared 8 weeks prior to your holiday commencing. Failure to make payment with clear funds by this point, will result in the period being re-advertised, and potentially, the loss of your booking. In the event of a cancellation after full payment, we will attempt to re-book the period. If we are successful, we will look to refund the payment, less any discount given to new hire, less the non-refundable deposit. Payments are to be made by Bank Transfer, or by cheque. For all Cheques, 10 working days should be allowed for posting and clearing. We will supply an invoice confirm payment of deposit, and full payment details for all bookings. The booking in time is 3pm, and booking out time is 9.30am. You will need to supply all of your own bed linen (bottom sheets and duvet covers). The master bedroom is a double bed, the 2nd and 3rd bedrooms have single beds (twin beds in each room). You will also need to supply your own towels. You must adhere to the terms and conditions of the Waterside Holiday Park at all times. We reserve the right to demand compensation from the named hirer for any damage caused to the caravan and or property of the caravan, however it may have been caused, during your letting period. Please Note : We only hire Saturday to Saturday. We do not do part weeks or weekends only. 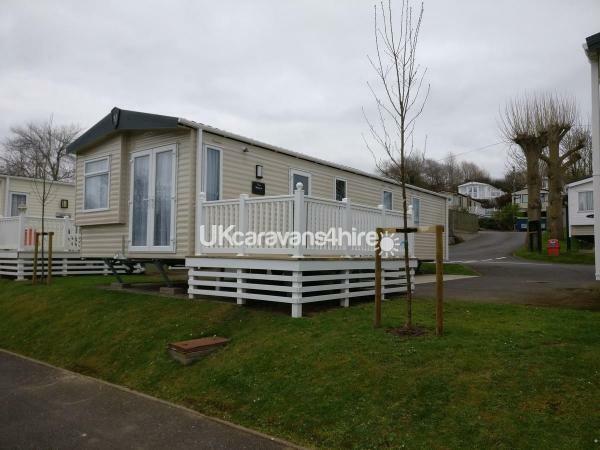 Private Caravan for Hire on Waterside Holiday Park in Weymouth - Brand New in 2018. 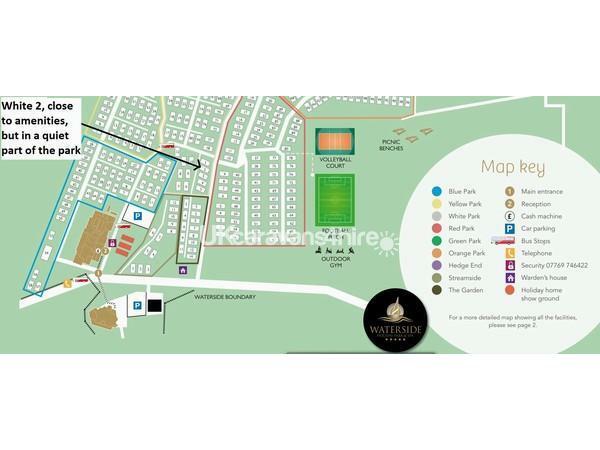 The caravan is located at White 2, on the Waterside Caravan Park, Weymouth. 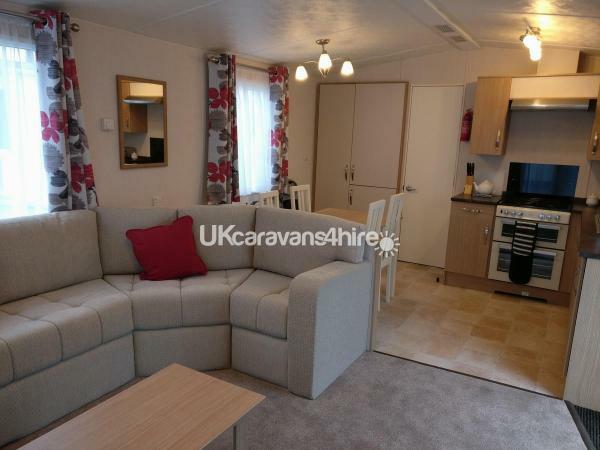 This is a fantastic pitch, close to the sea and amenities, but far enough away to be quiet.The living room is slightly elevated above the other caravans, which means you look out over the top, towards the sea (just out of view) and inland. 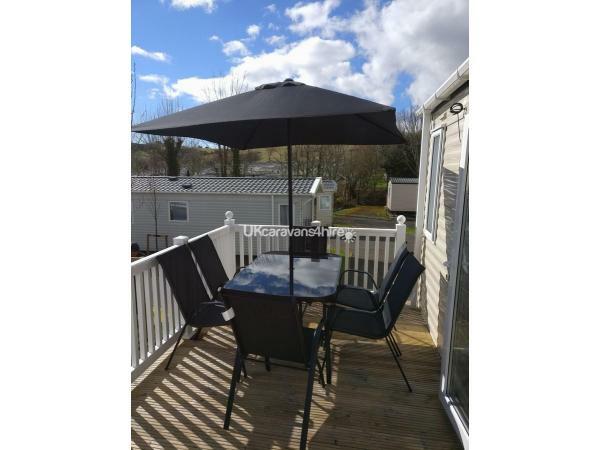 There is a gated uPVC decking area (2.3mtrs wide x 3.65mtrs long) with table and 6 chairs (there are an additional 2 fold up chairs inside). which catches the sun most of the day. 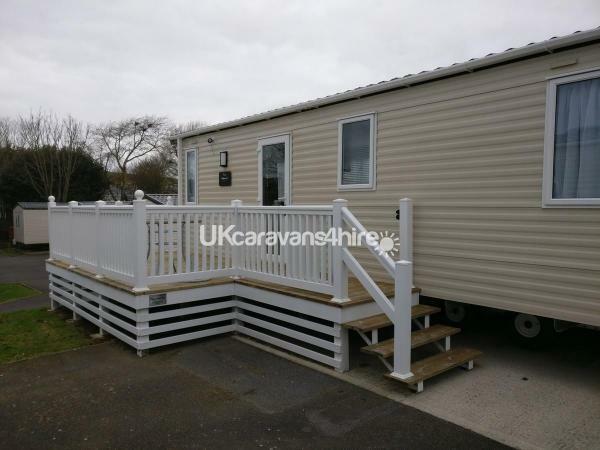 Parking is available alongside the caravan and decking (enough for 2 or 3 cars, but site rules state only 1 car is allowed next to the caravan). 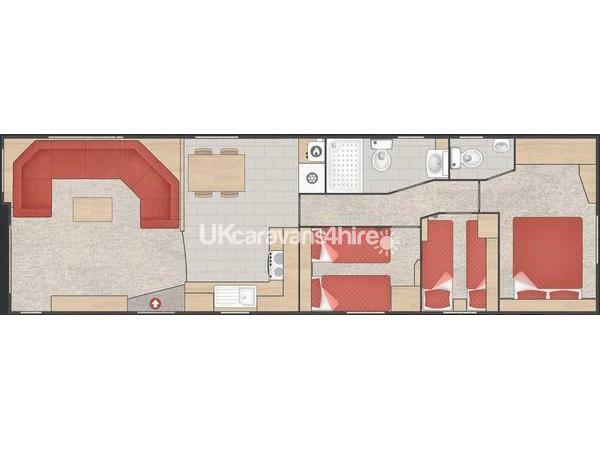 This amazing Victory Belmore Outlook caravan is a high spec caravan, and has an amazingly large open plan layout as you come in through the door. The lounge, dinning room and kitchen area give a real sense of space. 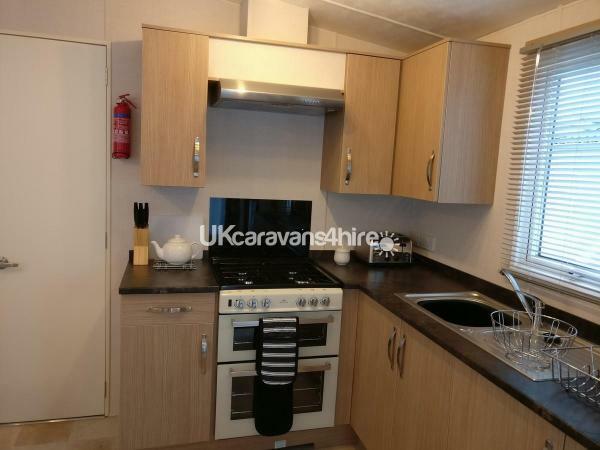 This modern caravan has all of the latest features, TV in living room (32" with Blue Ray DVD player) and master bedroom (24" with DVD player), main bathroom with shower, master bedroom en-suite toilet, gas central heating, double glazing throughout, fridge / freezer / microwave / gas cooker etc. A large number of the power sockets have USB sockets built in, just in case you forget your charging adaptors. Gas, electric and water are all included. 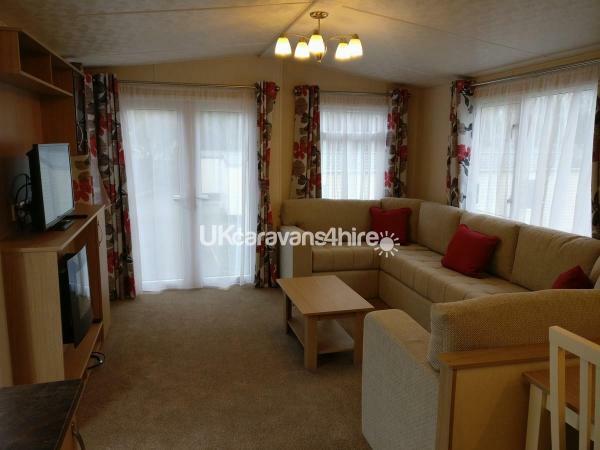 The caravan is set up for use by 8 people. This includes plates, bowls, cups, glasses, cutlery etc.It also has a range of saucepans, frying pans, and dishes for cooking with. 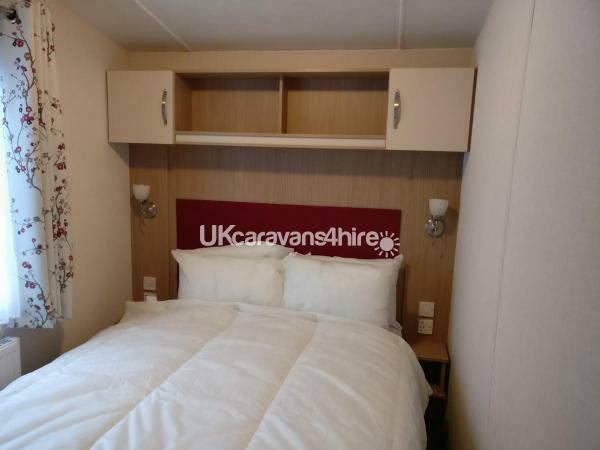 The master bedroom has a double bed with en-suite toilet and wash basin and several clothes cupboards. The 2nd and 3rd bedrooms have twin beds and one clothes cupboard in each room. There is also a pull out double bed in the living room that can sleep 2. Dinning room area has a large wooden table, with 4 wooden chairs. There are also two fold up chairs that can be used, and if you have a full 8 people, then there is also 6 chairs on the decking. 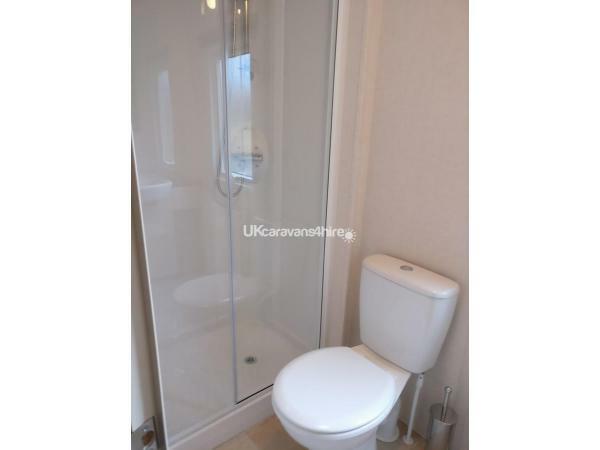 There is also a main shower / toilet / wash room. 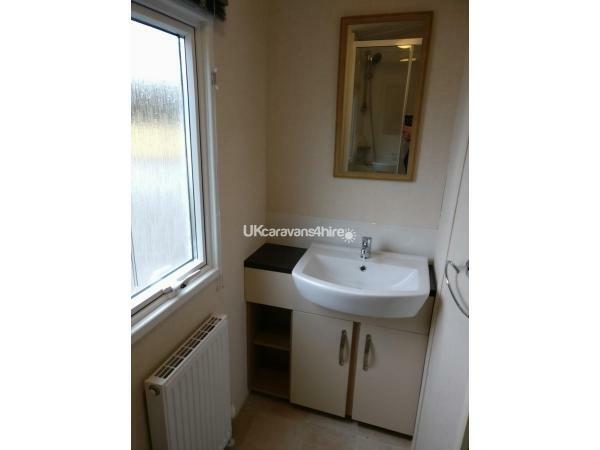 For a caravan, this is actually quite large (but smaller than a usual home bathroom. 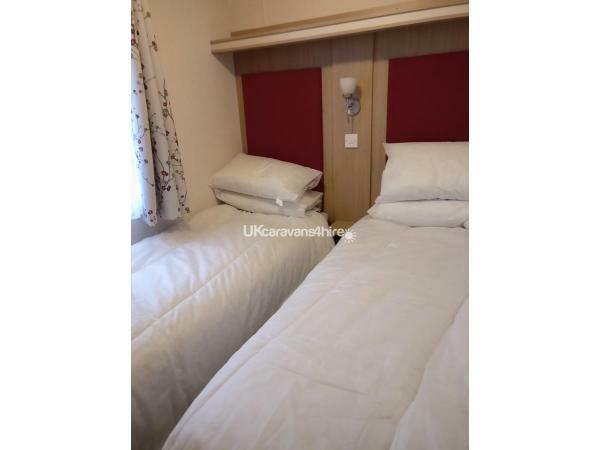 Excluded - Bed Linen - you will need to bring your own bed linen - double sheet and duvet cover for the main bed and pull out bed, and up to 4 single duvets and sheets for the other beds, plus pillow cases (there are 12 pillows). Each bed and pillow has a mattress / pillow protector. Excluded - Towels - you will need to bring towels for showers, hand washing etc. Onsite there is a sports bar, club, amusement arcade, indoor and outdoor pool, launderette, SPAR store, takeaway, restaurant, spa and gym. Entertainment passes are FREE, there is a small charge for premium areas such as gym and swimming pools, payable on use. There is a regular bus service to Weymouth town centre.